July 27, 2017 – Cadets from the U.S. Air Force Academy (USAFA) in Colorado Springs, Colorado, were at the Space Foundation Discovery Center on July 25 to highlight progress on the Falcon Satellite Program and other activities. A satellite built by cadets and loaded with high-tech experiments is ready to launch into space in 2018. The FalconSat program is a year-long senior capstone experience in which cadets design, build, test, and operate satellites. The Academy began the program in 1993 to give cadets hands-on satellite development and operational experience. Its administered by the USAFA Space Systems Research Center under the direction of the Department of Astronautics and also gets support from U.S. Space Command. The latest Department of Astronautics satellite slated for launch, FalconSAT-6, will carry five primary payloads. The main experiment is designed to prove the effectiveness of multiple thrust modes. Other experiments will prove the most fuel-efficient changes in orbit and test low ion head thrusters, testing the effectiveness of wireless vs. wired telemetry, and measuring changes to the local ionospheric environment. The satellite will also carry an experimental solar array and testing equipment to measure the gases released during a rocket launch. As with previous missions, the satellite is designed, built and tested to meet the requirements of Department of Defense payload and mission requirements. Once FalconSAT-6 is placed into orbit, it will be operated by cadets from the Academy’s ground control station, which is designed to mimic the modern systems used by Air Force Space Command personnel. FalconSAT 6 is designed for one year, but the cadets hope to operate it for at least three years. The orbit will degrade within 25 years. FalconSAT-6 and FalconSAT-7 (built by the Academy’s Department of Physics and destined to become the world’s first space-based membrane telescope) are currently manifested for launch aboard a SpaceX Falcon Heavy launch vehicle projected for launch in April 2018. Meanwhile, work is underway to complete FalconSAT-8, which is tentatively slated to launch in 2019. The Academy FalconSAT program is designed to give cadets practical experience that goes well beyond building a satellite. Cadets meet with representatives from military and civilian organizations who present their proposed payload concepts. The cadets evaluate the presentations and decide on the appropriate combination of payloads for each satellite. The cadets then need to develop their own presentations to government agencies for funding. Teams of cadets build and test the satellite within a narrow budget and evaluate their launch options. Cadets also have to travel to test sites, evaluate the test results, and talk with industry professionals. Presentations like the one at the Space Foundation Discovery Center and the annual Space Symposium give cadets an opportunity to hone their presentation skills. Compared to most commercial satellite projects, cadets at the Academy work with a considerably lower budget and follow an accelerated development cycle. They also have to deal with near total personnel turnover every year as cadets graduate and new cadets move into the program. Careful documentation is critical to ensure continuity of the program. Most cadets involved in FalconSAT projects are pursuing a Bachelor of Science degree in Astronautical Engineering, but the program is open to any cadet who would like to be involved, regardless of major. Students from electrical and mechanical engineering and computer science are also frequently involved, as are other disciplines. A prestigious group of professors mentor cadets and provide guidance for the project. FalconSAT has a sister project, FalconLAUNCH, to design and develop sounding rockets. The program is also offered as a senior capstone program with a multidisciplinary cadet team and faculty mentors. During the year, the FalconLAUNCH team designs, builds, tests and flies a solid-fueled rocket carrying cadet-designed and Department of Defense payloads. In 1991, the cadets flew a 21-foot sounding rocket powered by a hybrid (solid fuel/liquid oxidizer) rocket motor to an altitude of 20,000 feet from Fort Carson, Colorado. Cadets continued to advance hybrid rocket propulsion technology by testing various combinations of fuels and oxidizers. FalconLAUNCH VII, constructed by cadets in the Class of 2009, was the first multi-staged rocket in FalconLAUNCH history. In order to maximize altitude, the team opted for a “boosted dart” concept. The boost phase lasted approximately 4.5 seconds, during which approximately 100 pounds of propellant lifted the rocket to an altitude of about 12,000 feet. Once the boost phase propellant was spent, a small, inert dart separated and coasted to an altitude of 354,724 feet, or 67 miles above Earth. The dart housed an avionics unit that ejected from the dart body frame at apogee so that the team could recover data from this stage of the flight. 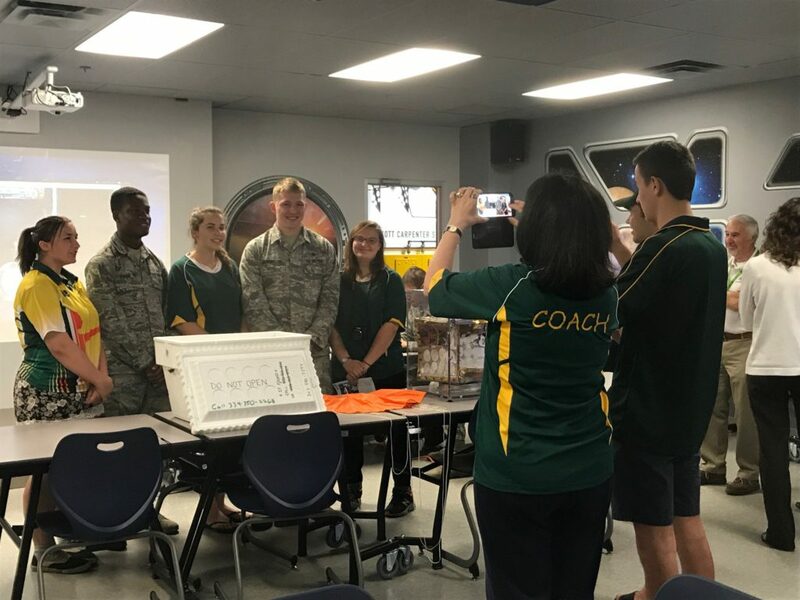 For the past few years, the Academy has taken time away from the FalconLAUNCH program, but cadets say the Academy intends to restart the program this year. Space has always been a part of the Academy curriculum. Since 1965, the school has offered a major in astronautical engineering, one of the few accredited undergraduate astronautics programs in the nation. The physics department also offers a major in space physics that deals with environmental problems in space. Additionally, the Academy offers an interdisciplinary space operations major. This major provides the necessary background for graduates to meet the needs of Air Force Space Command, also headquartered in Colorado Springs. Many Air Force Academy graduates have become astronauts. Graduates participated in all aspects of space shuttle missions, from piloting the shuttles to serving as payload and mission specialists. Col. Karol Bobko, Class of 1959, was the first graduate in space, piloting the space shuttle Challenger in April 1983. Col. Fred Gregory, class of 1964, was the first African American to pilot a Space Shuttle (Challenger 1985) and to command a Space Shuttle (Discovery 1989). Col. John E. Blaha, a 1965 graduate, piloted Discovery in March 1989. Later he participated in joint U.S.-Russian research while residing aboard the space station Mir from September 1996 until January 1997. Maj. Susan J. Helms, Class of 1980, was the first female graduate to fly in space; she was a mission specialist aboard Endeavor in 1993. Lt. Col. Eileen Collins, a former professor in the mathematics department, became the first female to pilot a space shuttle in 1995. The most recent Air Force Academy graduate in space is Colorado astronaut Jack Fischer. Fischer graduated from the Academy in 1996 with a Bachelor of Science in Astronautical Engineering. He went on to receive a Master of Science in Aeronautics and Astronautics from the Massachusetts Institute of Technology (MIT) in 1998 and is currently part of the Expedition 51/52 crew that launched to the International Space Station in April 2017. He will be on the ISS until September. Fischer said his childhood dream of becoming an astronaut led him to the Academy. He’s the 38th Academy graduate to become an astronaut. Several U.S. Air Force Academy undergraduate engineering programs rank among the top in the nation and the Air Force Academy plays a vital role in the U.S. space program.